Welcome to the June edition of the My Pink Stamper Blog Hop! If you arrived from my friend and fellow Design Team Missy's Blog you are on the right track. If you are just visiting welcome! Today we are showcasing the NEW My Pink Stamper Yankee Doodles Image Stamp set that you can find for sale in the Shop Pumpkin Spice store. Here is the link for the set. They will be available for order today at 12 PM Central Time. These are so fun to play with! I decided to use a variety of the stamps from the set to create a collage. Easy, fun and just in time for the Fourth of July! I had this stupid idea to photograph it outside since all my flowers are so pretty this year...unfortunately I wasn't thinking that I live in the suburb of the "Windy City" and windy that day it was. All I really did was chase the card around the yard....I guess that counts for exercise right??! I colored the card with ProMarkers also available in the Shop Pumpkin Spice Store. Please go back to My Pink Stamper and see how you can win this stamp set! BUT....first please hop along to my friend Tracy's Blog. She is the last one on the list! Take it away Tracy! Cute card! I've chased cards around my yard, too. They do photograph nicely outside. This is an amazing card Maria!! your cards are always amazing! Way to showcase the stamp realease! Such a cute card - I love the bright colors! Gorgeous card! I think I need to try these Pro markers! You've used them to perfection! What a fun and festive card! So bright and colorful! I lol'd imagining you chasing your card around the yard :) ! Great job, and TFS! Lovely card and flowers! and yes, it counts as exercise! Very clever stamping BOMM BOOM BOOM to create a frame! Cute card! Beautiful card! I love the way you put it together with the big oval to showcase all the new stamps. It's very striking. Very feztive card! Love hpw you showcased Robins newest release for such a colorful holiday! Wonderful job. You made me laugh, Maria. I can just picture you chasing your card all over the yard. And, yes, itr does count as exercise. LOL Well, it was worth it because the photo is beautiful as is your card. TFS - and I'm so happy you're on Robyn's DT. Beautiful card! Your card looks like the firework going off! Love it Maria. I love the flowers too! Card great card and your flowers are beautiful! 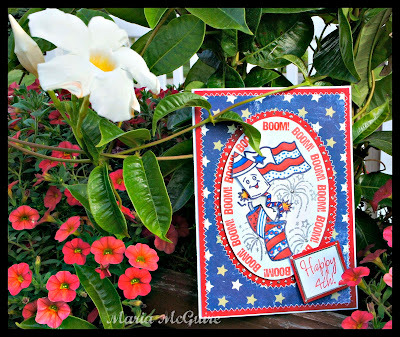 What a fabulous card Maria, I love the "boom" border and how you incorporated so many images!! I love how you combined the different stamps in the stamp set to create your collage on the card. That all made the card pretty unique. Thanks for sharing your card idea. That wind totally messes with me when I photograph (even paint) outside and I don't live in the windy city! Your photo looks great - the flowers match your wonderful card perfectly! !